Every child's personality is multifaceted. The emotions, feelings and values about self and the ways of viewing his or her place in the world are all parts of what makes each child unique.Between the ages of 3 and 5 is when a child's personality is really going to emerge. Children discover their independence and what they want to explore around them. They usually want to do things on their own, as well as be in control of their environment. 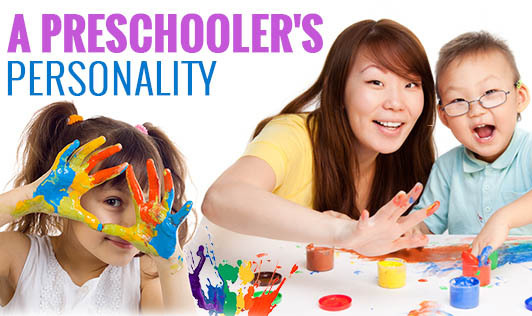 Here's what you can expect during your child's preschool years. During preschool years, children gain more self-control and begin to rely less on others and more on themselves. They learn to calm themselves down when they get scared, upset or even excited. They start becoming more attentive, less emotionally reactive and even start building self confidence. • Keep in mind that every child is unique: "Healthy personality development is fostered by parenting that is sensitive and responsive to the individual's strengths and needs of the child" says Kirby Deater-Deckard, a psychology professor and author of Parenting Stress. • Avoid labels: As a parent, you would want your child's personality to develop on its own without being wrought by your or anyone else's views. Hence, avoid labelling your child with words such as shy, bossy and emotional. • Encourage play: Play has a very great influence on a child's development, and giving your child time to play and interact with other kids is one of the keys to helping your child's personality blossom. • Set an example: You're perhaps the person who your preschooler watches and imitates the most. Hence, you will need to make sure you practice patience and politeness that your child will emulate and learn. • Understand its nature and nurture: Both equally determine and together create diversity of a child's personality. • Lastly, give your child a chance to be herself or himself, and not an image of you: You may want your child to be like you, but it's important to let your child be himself or herself and meet the world in his or her own way. "Go ahead and make every effort to create a loving and supportive environment and relish your child's strengths and qualities"